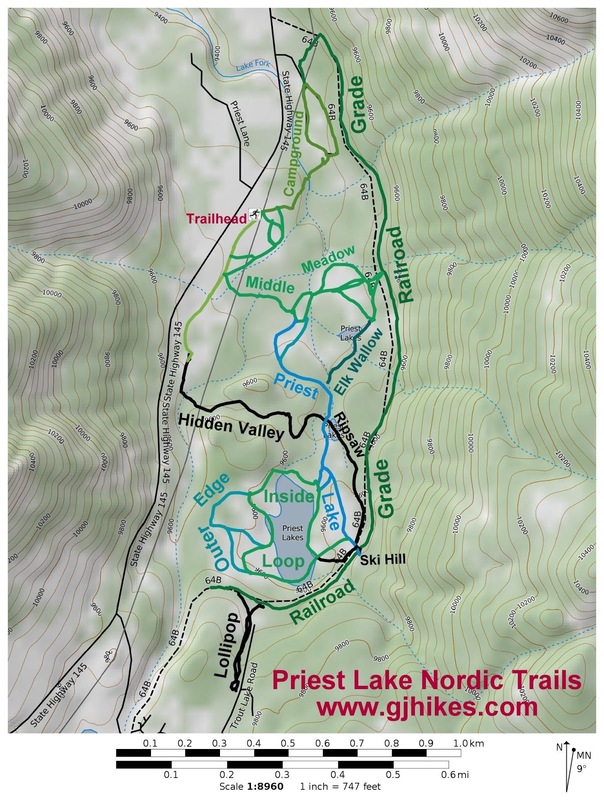 The Campground trail is located in the Priest Lake Nordic Trails area near Telluride, Colorado. The trail, which is situated close to the trailhead, makes a loop around the Matterhorn Campground. The campground is closed during the winter months making the road a good route for an easy Nordic trail. To get to the trailhead measure 9.3 miles from the roundabout just north of Telluride following Highway 145 up Lizard Head Pass. The parking area will be on the left at the sign in this picture. 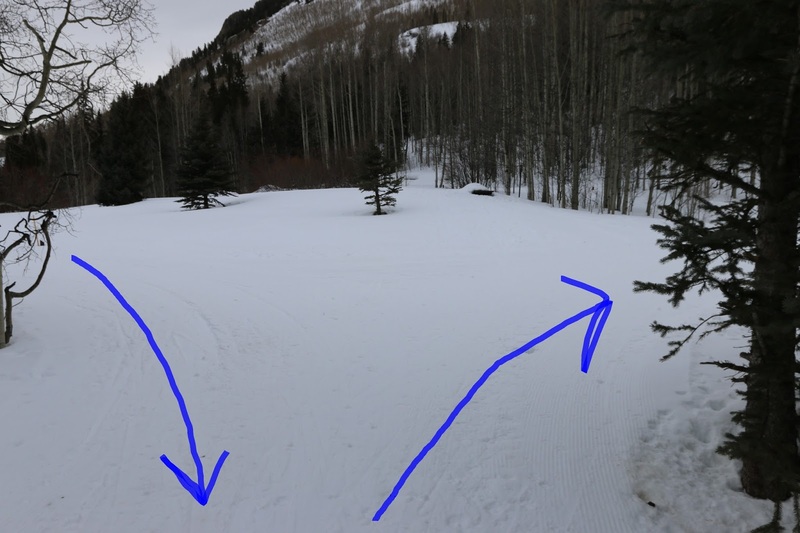 There is a donation box at the trailhead where you can pay the requested $15 grooming fee. Go east from the trailhead in the direction of the Matterhorn Cabin and other buildings. The trail snakes its way around the buildings as it reaches them. After passing the buildings the trail begins descending slightly through a sparse stand of aspen trees. The trail levels off as it crosses a bridge that takes it over Lake Fork Creek. A short climb away from the creek leads to the beginning of a loop that travels around the campground. For this post we followed the loop arbitrarily in the counterclockwise direction. The trail around the campground isn't flat but the hills are gentle enough for it to have an 'Easier' Nordic rating. At the north end of the campground the route begins looping back to the left while the Railroad Grade trail continues on the right. 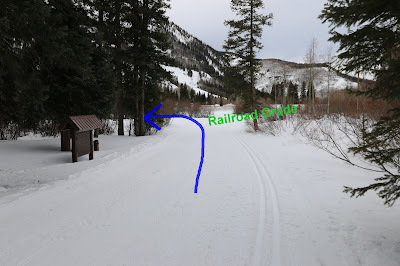 As the trail heads south it passes the campgrounds restrooms which are closed during the winter months. The loop comes to an end where the trail first reached the campground. 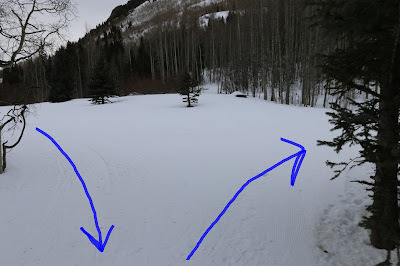 From here you can go to the right and head back toward the parking area and other trails. On the day that we were taking pictures for this post we opted to turn around and do the Railroad Grade trail next. 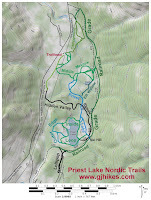 For those that are looking for an easier Nordic trail the Campground trail is a good option in the Priest Lake area. If you would like to see it for yourself then all you have to do is 'Take a hike'.